We are engaged in providing superior quality Wire Nails that are widely used in industries as well as homes for various fastening purposes. 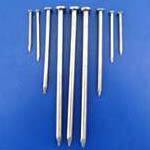 The Wire Nails range is manufactured with highly durable metal. We offer the Wire Nails range at market leading to the valued clients across he country.